Nassau County Executive Edward P. Mangano swore in a new class of 154 Nassau County Police Recruits at Police Headquarters in Mineola. 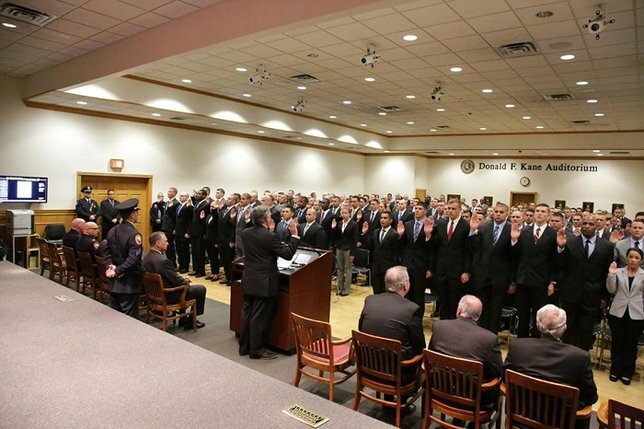 154 men and women were sworn-in as Nassau County Police recruits. Photo by: Nassau County Police Department, via Facebook. Mineola, NY - June 2, 2016 - Nassau County Executive Edward P. Mangano swore in a new class of 154 Nassau County Police Recruits at Police Headquarters in Mineola. The recruits will undertake 7 ½ months of rigorous training that will prepare them to patrol the streets of Nassau County. Just two days ago, County Executive Mangano and Acting Police Commissioner Thomas Krumpter presented certificates of completion to 185 police graduates that had successfully completed their Police Academy training, which was the largest class of graduates in over 20 years. Mangano Pays Tribute To Fallen Firefighter Joseph Sanford Jr.
Subject: LongIsland.com - Your Name sent you Article details of "Mangano Swears In 154 Police Recruits"